Most DIY and professional woodworkers regard the table saw as the most important. Also, they term it as one of the most costly woodworking machines. It is one single tool or machine around which most carpentry shops are centered. Thus, making any ill-advised buy is a hefty mistake. For that reason, we have focused our article on providing insightful information in regards to the best budget table saw for buying. Apart from aligning and discussing the top brands of table saws, we have also included a brief buying guide for you. When you want to upgrade the productivity of your carpentry shop and make it more beautiful, it is a prudent idea to consider Jet Proshop Table saw. It features heavy-duty cast iron top, has wings and a riving knife to ensure excellent functionality. 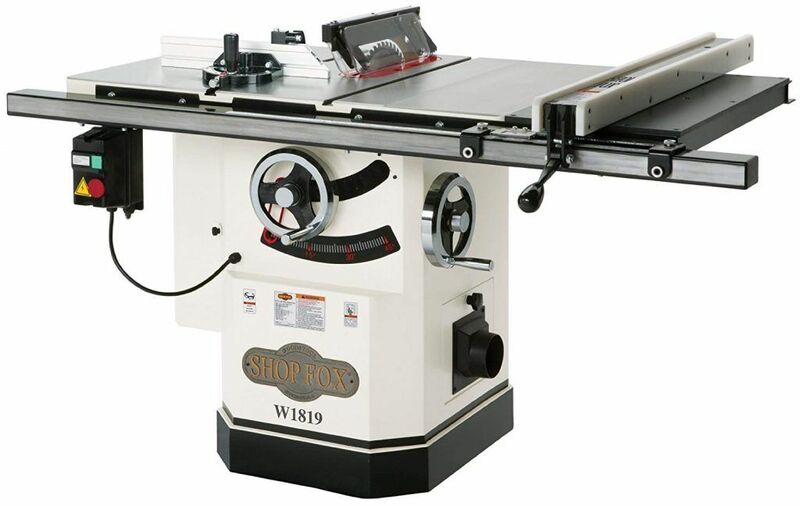 It has got the same features you would expect from the cabinet saws, yet it is available at a pocket-friendly price. So, this table saw offers maximum functionality and it comes in two options. You can choose the model with stamped steel or cast iron wings. On the other hand, it features a transparent blade cover that features independent leaves. It has a quick release knife that eliminates the chances of a kickback. Besides, a low profile riving knife is available for making none-through cuts. Besides, the system allows excellent blade alignment. So, it is pretty easy to adjust the blade when cutting various materials of varying sizes. It cuts true and smoothly even when dealing with hardwoods. The fence features a nice and functional design than you would expect. Also, it has an incredible cutting depth and the standard miter gauge allows great cutting precision and accuracy. This is another wonderful achievement by Bosch. 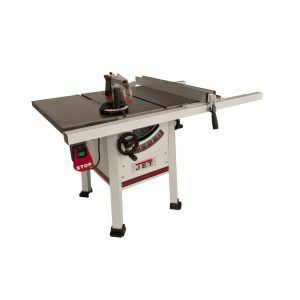 GTS1031 table saw features a premium design that is mainly designed for the toughest cutting jobs. It features a portable design, thanks to its balanced handle that allows you to move it to the place where you feel ideal. In addition, the base is made of strong and durable steel. Thus, it is robust and will surely serve you a lifetime or for a decade to be real. It is designed to tolerate the worst abuse in any wood shop. The square lock rip fence enhances accuracy and precision. Thanks to the self-aligning design that makes sure the material is cut as pre-determined by you. In addition, it features a smart guard that ensures you don’t put yourself at risk. Also, thanks to the included anti-kickback features that limit and reduce any chances of injury. Versatility is guaranteed due to 10 inches and 24 tooth-blade plus the 5000 RPM without load. In short, this is the best table saw for hard and rough wood cutting jobs. 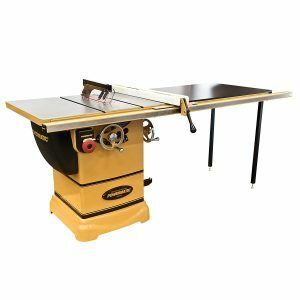 Powermatic is one of the top rated brands of table saws which are available at customer friendly prices, yet delivers impressive performances in all the works given to it. Its premium construction with excellent materials of construction makes it in a good position of the reviews. Featuring a cabinet design with 50 inches fence, this saw will surely deliver to satisfaction. The motor only requires 115 volts and functions smoothly and efficiently. It delivers incredible amounts of cutting power to rip cut and cross cut hardwoods without any delay. On the other hand, it features a blade surround and a hose that provide the unobstructed way for maximizing dust collection.The power switch is located in a convenient position to allow hands-free switching. With a tool-less guard and independent side sleeves, the machine is very safe and easy to use. In addition, it has a miter gauge that pivots 60 degrees on either side, to allow accurate and precise wood cutting. To add on that, this equipment boasts exclusive 30 inches Accu-fence system which provides ultimate stability and work-space you require. When you look carefully at every aspect of this saw, you will realize that every feature reveals a mark of quality. 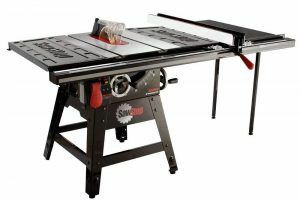 With the 3HP motor and heavy cast trunnions and triple belt drive, this table saw is made to perform all the hard work. With precision ground and smoothly polished cast iron tabletop and wings, the machine delivers uniform, accurate and smooth cuts. For easy and reliable dust collection, this facility features a 4-inch dust port. It is easy to fix vacuum cleaner to help in dust collection. Also, the machine is made with all necessary features to enhancing accuracy when making straight and beveled cuts. Thanks to the miter gauge, T slot and an anodized fence among other fantastic features. There is a true riving knife which follows the up and down mobility of the blade. Besides, the 29-1/2 inches rip capacity fulfills the premium design and multi-functionality of the machine.Other feature worth your appreciation includes the cam-lock fence, standard and dado inserts, powder coated paint among others. Last, not least, it features a guard, spreader and anti-kickback pawls. So, operating this equipment is very easy and safe. With a few practices, you can be sure to produce outstanding wood artistry. Sawstop is a dedicated brand that delivers the best table saw models to the user. Sawstop CNS175-TGP36 is one of the gigantic and excellent performing table saw. With professional T glide fence system, it delivers precise, accurate and smooth cutting performance. It has all its features being top class and worth every penny. With a variety of beautiful features, there is every reason to invest in this table saw. The most obvious one is the T glide fence system. This is an important feature in that; it allows precise cutting and safe lockdown. This system features heavy gauge steel construction to deliver excellent performance and durability. The dust collector has a large capacity and features vacuum connection port. So, you can remain clean, breath clean air while working with this equipment. Besides, why should you expose yourself to carcinogenic sawdust? With this equipment, all health hazards are addressed and you can work with the machine for a whole day without any air contamination. Versatility is guaranteed with that table saw. Thanks to the premium design which feature cast iron wings. These wings align smartly with table, rails and extension tables. Moreover, the weighty platform increase stability, allowing easy cutting of large and overweight stocks. On the other hand, this saw boasts several mobility options. Thanks to the adjustable height of the sand, casters and two fixed wheels. You can easily position this heavy-duty saw in any particular direction. Another brand that represents the mark of quality, Bosch has changed the lives of many woodworking specialists. With 4100-09 model, every feature counts in delivering professional results. It allows you to rip off and crosscut all types of woods and at customized angles. Hence, a great tool not only for job site but also for cabinetry. Some simple upgrades are great for delivering excellent results. With this portable and innovative table saw, you can now do all the things you’ve been dreaming of. It features a collapsible design whereby the height is also adjustable to meet the needs of different users and the demands for various projects. For portability, there is no single guesswork. Thanks to the two pneumatic wheels that deliver incredible mobility of the equipment. If you want an amazing cutting trueness, just give this machine a try. It features a square lock rip fence that’s specifically constructed to increase the cutting trueness and precision. It precisely allows you to operate it by one hand as you glide the rail, anti-kickback pawls, and riving knife. Hence, it enhances safety in case the kickback occurs. The cutting width is about 25 inches. Hence, great for cutting a variety of stocks without any hustle or bustle. The motor features a high torque production at 3650 RPM. 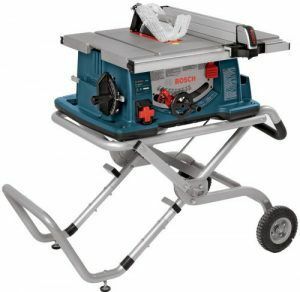 These are just some few features of this Bosch table saw. However, it offers more than that and is a true partner when you want to take your woodworking business to the next level. Rockwell is a reputable maker of power tools that have a long experience and professional expertise. One of the main areas they have recently made positive achievement is about table saws. One of their best models is Rockwell RK7241S which features laser function for added performance. Finding a heavy-duty yet versatile table saw is a tricky process. But this is what this Rockwell model provides. It is built with heavy-duty yet lightweight materials to make the performance very effective. The design is appropriate for the job site, shop or a cabinet shop. With 30-inch rip capacity, this machine is the best in its class. If you are looking for accuracy and precision, you would then need equipment with laser technology. Well, this table saw use a laser indicator that precisely adjusts the blade tilt. This is an advanced feature which most tables saw models lack. The equipment lies on a ready-made trolley stand which facilitates easy portability. The fence features a folding design which is quite an excellent feature which isn’t common for other models. This folding capability of the fence allows easy cutting of extra wide materials. Featuring 9/16 inches cutting capacity, this machine is ideal for cutting through a 4 by 4 inches dimensional lumber. The overall weight of this equipment is approximately 88 pounds. However, don’t get shocked about hardships of transporting it. The blade capacity is 30 inches and delivers fast rip and cross-cutting functions. There is no gamble about quality when Dewalt is your choice. And, with DWE7491RS jobsite table saw the model, you even gain more due to the combination of exquisite performance and quality features. If you are looking for a smooth and accurate cutting performance, this model is also the ultimate choice. Thanks to the pinion and rack fence system which fence adjustment incredibly fast, precise and accurate. With 32-1/2 rip capacity, this is one of the best table saws to own. It enables cutting of large shelving and trim materials with ease and precision. All this performance is made possible by the awesome powerhouse. Thanks to the 15 amp motor that delivers a high amount of torque to rip off hardwoods. Besides, the flip-over ripping- fence also allows you to cut narrow rip cuts. The dust collection facility is built well and features 2-1/2port for easy connection to the vacuum device. Thus, dust collection is efficient and easy for this table saw. On the other hand, the rolling stand is designed delivers awesome portability and the equipment boasts easy setup. Having that in mind, we have provided a checklist of features to help you I making reference when buying a table saw. there are two features that you need to address before buying a table saw. However, we are going to focus on the most important ones that will ensure you get the best budget table saw for your work. As expected, this is the foremost and the important factor anyone would be looking in any motor powered machine. For the table saw, this factor is inevitable if you want the best performance for your machine. One thing to understand here, the motor power increase from the bench top models to cabinet models and that is a fact. Amperage and voltage are the things to evaluate here. For instance, a 15 amp motor goes hand in hand with 120 volts AC power which is pretty enough for ripping performance. Now, the power for cordless models isn’t as much as for corded models. So, corded models are the best for large woodworking projects and the small project can be served by the portable or cordless models. 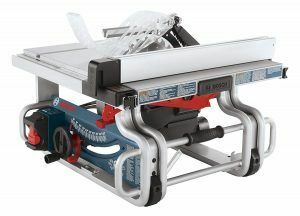 Most of the jobsite table saw models feature direct drive. However, in typical cabinet saws, you’ll get belt drives. The drive-power truly governs whether a model can be regarded as lightweight or heavy-duty. Depending on the intended use, you’ll need to use wisely. Putting other features asides; the blade type has a profound impact on the performance of the saw. Most standard models feature 10 inches diameter for the blade. Now, these blades provide inches capacity at 90 degrees cutting angle. Precisely, a cordless model features 8.25 inches blades and hence gives less versatility than the corded versions which use 10 inches. There are important things to understand for the RPM. For the job site or the bench top models, the RPM of the motor is also the RPM of the blade. However, for cabinet or contractors models, there is a difference. But, every manufacturer has to decide how to channel blade speed and torque. So, the RPM doesn’t necessarily reflect the performances. It is prudent to check the torque as well. Besides, very high RPMS can burn some types of hardwoods as the blade cuts through. 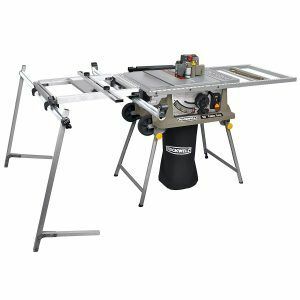 Unlike the shop saws, jobsite saws feature a lightweight aluminum table saw. Shop saws feature table top made of cast iron which makes them sturdy but quite heavy. A fence, on the other hand, allows you to make accurate cuts perfectly parallel to the edge. So, a fence should be perfectly square to the table. Most top brands feature rack and pinion design and are great since it locks in place as the table does the moving. Most jobsites feature an arbor that measures 5/8 inches in length. if you don’t know, the arbor is the shaft that holds the blades and allows it to move at angles. Before buying the blades, it is important to check the arbor size carefully. 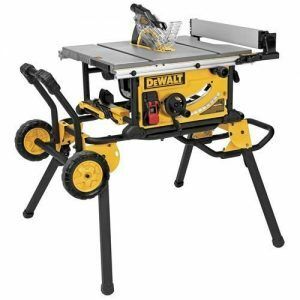 An ideal table saw for the jobsites should feature a rip capacity that is 24 inches or more. You may also be surprised that some models boast as much as 35 inches rip capacity. But since there is a waste edge opposite the fence, you can a larger capacity. The depth of the table is usually the outfeed capacity of the machine. Now, professional using the jobsite saw opt to use a sawhorse or other supports in a bid to hold the material when it is past the blade. Dust collection facility, throat plate, dado capacity are important features too. They all play important roles in performance and ensuring that you work comfortably. Table saw Safety features of tools also shouldn’t be overlooked. Blade brake is the most important safety feature for any saw. Some advanced designs feature flesh detections capabilities to ensure that the machine goes off in case of slight injury. At least now we have the relevant knowledge regarding the features of a table saw. Now, let’s explore some top-rated and best-selling table saws in 2018. There are uncountable questions that ring in the minds of people when making orders for a table saw. People can ask almost any question, and the following are some common questions. Q: What are the motor’s specifications? Q: what is the blade capacity? A: it depends from one saw to another. Higher values are better since it indicates how tough the blade is. It is true that every woodcutter shop must have a table saw. There is no woodcutter who can operate without the use of table saws. It is a great machine in making woody buildings, furniture among other important activities. It is a machine that forms the backbone of any woodworking business. No one can ever deny the roles played by a table saw. Even though it is very dangerous equipment when handled carelessly, it is a valuable machine with lots of benefits. For the matter of time, here are some straightforward benefits of a table saw. The obvious issue that comes to your mind when you think of the benefits of a table saw is the ability to make straights cuts. However, the ability to make cuts at high precision and accuracy makes this equipment the best. Apart from making straight cuts, table saw also makes customized angled cuts. In fact, it is the ultimate tool for a variety of wood art styles. It is the ideal device to use when you want to make cuts of some angle and size and width. Does your work involve fitting flat or horizontal woods collectively? Then you need a table saw more than anyone else. This device can be fitted with additional blades, to help you make accurate and precise slots in wood materials. Even though this work requires great care, it is easily achievable when done by a professional. Since flat woods are required in the building of virtually any kind of furniture, the table saw is inevitable. It is an ideal tool for cutting huge logs into a variety of pieces required in furniture construction. Equally, the same machine is a must in cabinetry. Now, cabinets allow proper room utilization any building. Without table saws, it would be very hard to build these cabinets. With so many wood cutting machines available, a good number of them don’t deliver smooth cuts. But table saws are made to deliver smooth cuts. Besides, accuracy goes hand in hand with smooth cutting. Unlike the traditional saws, table saws are famous due to smooth cutting and precision. Most of the electric table saws use powerful motors wit awesome RPM and torque. It cuts deeply into the wood in just a matter of seconds. Also, they are great for cutting tough hardwood and incredibly wide logs. Moreover, they are great machines for delivering accurate rip and cross cuts. In other words, it can perform all cutting tasks with great precision and accuracy. A table saw features a collapsible design whereby you can store it in parts, transport it and do some maintenance with ease. So, apart from helping you at your wood shop, you can also transport it from one jobsite to another with ease. You may overlook some of the carpentry tools, but a table saw wouldn’t be possible. it offers an amazing versatility in cutting jobs and this makes it very popular. We have pointed out and discussed the important features of the top rated model of table saws. It’s upon you to make a simple choice now and take your carpentry or cabinetry skills to the next level.